Two Hands is one of my very favorite cafes in the city, of course, I had to get a peek behind the scenes. 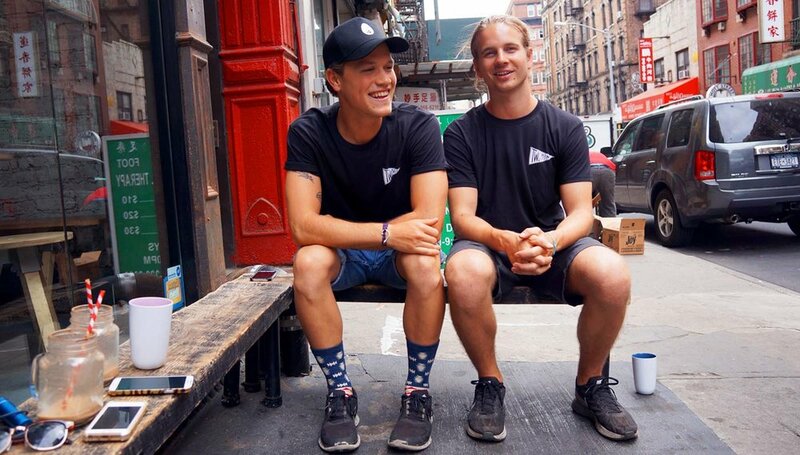 Between the super delicious food, truly above par incredible coffee, the beautiful clean environment that they've created, a huge fan base giving them lots of love daily on their super fun Instagram and the outrageously nice owners (their Aussie accents certainly don't hurt), what's not to love?! Back to those delightful Aussie accents. I sat down with owners Giles Russell and Henry Roberts for lunch at their cafe, Two Hands. After demolishing everything I could get my hands on, we moved outside for a more formal interview which felt far more like super fun chatting with lots o' laughter! "It’s not just a coffee shop, it’s a community”. MW. When I think about the name “Two Hands”, immediately, I think of two hands one that is holding coffee and the other holding great food or the work going into it using two hands. I hear you two chose it based off of the Heath Ledger movie. How did that come about? Henry: It wasn’t like we were watching the movie and were like “oooh, Two Hands”. Giles: The movie’s really weird. Henry: It’s really good though. Giles: It’s about bank robberies. Henry: It just kind of popped into my head while I was at work and then it related to the film. One that is an Australian reference that wouldn’t be like Crocodile Dundee or something. Henry: Like you said, it does have all of those kinds of meanings as well. That’s why it fit well for the cafe and being the name of the cafe. And, it’s interesting because to be honest, you go through so many names, like anything, and that one stuck. It wasn’t too out there. It wasn’t trying to be too creative or too smart. Everybody asks about the name and I don’t really understand it. "Two Hands", it’s not that crazy. I mean, when you interview other restaurant owners, do you always ask why they call it that? MW. When the name is of interest. In your case, it’s a simple name. So, in reading previous interviews you had done when doing my research I read about the Heath Ledger movie and because so many other reasons made sense to me, I wanted to ask again to see if, over time, now that the cafe has been open for nearly a year, does it feel as though it’s taken on more meaning for you? Giles: It had that meaning before we opened, I think. As soon as Henry called me up and was like “I think I’ve come up with a good name” and he said “Two Hands”, initially, was we both knew the movie, it’s set in Sydney where we both grew up, it features Heath Ledger. As a young Australian, everyone looked up to him. He was an amazing actor and he was a cool dude and he lived in New York back before he passed away and he has his own restaurant in Brooklyn called Five Leaves—we both love Five Leaves. It’s the first restaurant I went to in New York. He inspired me to do something in New York that had that feeling, that uniquely Australian feeling. After we thought about that, it was like, ok what else does it mean—we know we built this place with our two hands, yeah, we make coffee with two hands, we make food with two hands, we shake hands, you high five, you know, hug, everything—it’s a mean whateva you want it to mean kind of name. I think that’s great because this cafe should be whateva you want it to be for every individual that walks in. MW. With such a design-driven cafe, what was the driving force behind the handwritten logo? Is it meant to be a signature, your signatures? Henry: We wanted it to be handwritten, for sure, to have that essence of homeyness just being natural and hands on—and that represents the cafe, as well, it’s not a sort of corporate structured place that’s clean cut. Giles: There are so many logos coming out in the past couple years that were just simple minimalistic fonts—design agencies, clothes brands—and they’d choose between four fonts. So, we wanted to be a little bit different. We wanted a logo that no on else had, that no one else could copy. We are very lucky to have a close friend who is a graphic designer and illustrator and we showed her a few different logos of different restaurants and told her ‘we envision it to be somewhat like this’ and she came back, showed us that and we knew it was amazing. We wanted to start with a strong logo but we wanted to grow it outside of one logo. There’s so much you can do with a name and a logo. We wanted people to know the name “Two Hands” and not just the logo. So we’re starting to work with different designers on different logos, so depending on the medium or the store or city that you’re in, you’ll get a different logo. Henry: If you look at these tee shirts [noting the shirt they are both wearing], this is the flagship store so it has the flag. MW. Sticking in this artistic vein, in a cafe so loved and extremely highly photographed by food lovers and bloggers, alike, on Instagram have you begun to see the food as a form of art? Giles: It is but it’s also so simple. It was a surprise that people gravitated towards taking these pictures—and it’s great. It’s great for us and that people are interested in food, and what’s on their plate, the different colors. It just kind of grew. I didn’t expect it at all. MW. Are you saying that you didn’t expect to have such a big impact on Instagram? Giles: We didn’t even know that Instagram functioned in that way. I wasn’t really on Instagram and neither was Henry. So, we started one. Henry: It’s just one other thing we do. Giles: We were like “oh, yeah, we have to get Instagram” so we took a bunch of photos of us hanging out in trucks and what not. Because our food is simple and it’s designed to be simple, because we feel that that tastes the best. We don’t feel like we have to do too much. If you have good produce then it should taste good. You don’t have to turn it into a foam or shave truffles all over it—that food’s great, I’m not dissing it, I enjoy that as much as anyone else. We want our cafe to be accessible to anyone. Anyone who walked in. That’s why the menu is small, and that’s why the ingredients are few but they all taste really nicely together. Part of that is the food being really attractive. When we’re at home, neither Henry or I are trained chefs but we’re both very very avid home cooks. You know, you go to a restaurant and you see this delicious meal at whateva restaurant it is in New York—and there are so many amazing ones—then you come home, and you’re like ‘I’m going to cook something’ and you try to mimic that—oh, they had the au jus like that and they have sprinkles of this on that [lots o’ hand gestures]—when they reach the table it’s a visual feast, not just a food feast. We definitely strove to do that because we knew our food was simple in essence but we wanted it to be exciting when it arrived to your table. We never thought our food would translate to Instagram but it obviously has because that’s what people are looking for. They’re looking for colorful food in exciting new ways—like our açai bowl we decided to do it like that because we hadn’t really seen it that way before we’d like to do something different. It’s really cool because you see people come in every day and take photos and you know that’s the new way they’re telling people that they really love something. MW. A few months ago, I sat, sipped a coffee and did some recognizance work in your shop. I noted you, Henry, sitting by the window doing work on your computer. Before leaving, it seemed like every person would stand up and introduce themselves to you. Each conversation lasted a good five minutes! And with the patience—of clearly a not native New Yorker (like myself)—you spoke to them as if they were the only ones to ever approach you. For me, it was seeing THAT that made it clear that being a part of the shop day to day is extremely important for you. What do you find is the most important part of the Two Hands experience? The people? The coffee? The food? Henry: If you come in and have an average kind of coffee [not that there is anything average about their coffee] but have a beautiful experience with the people you interact with in that space then you’re not going to not come back because of that and you’re more likely to return. We are really lucky with this street because we have such a mix of neighborhood people, the Nolita crowd, big shoppers from SoHo, Little Italy tourists, Chinatown—it’s just been great to meet everyone from day one and every day coming to work and meeting all different people. And, you never know who you’re going to strike up a conversation with, who can help you out, or who knows someone who knows someone, or a graphic designer. That’s kind of like our motto is to be nice to everyone and you never know. Giles: Why are we not on this earth but to connect with people. Those relationships are what makes us happy. MW. How do you guys know each other? Henry: We knew each other from back home. We weren’t like close close friends. We lived on the other sides of the harbor—I don’t know if you know Sydney—he lived on the Eastern suburbs and I lived on the North Shore. Giles: Like Brooklyn and Manhattan. Henry: But like less ‘street’ sounding I’m from Brooklyn. When we saw each other socially we would always get along and connect well. So, then when he came to New York, as soon as we had an opportunity we got together. It was kind of business from then on—friendship and business. When you come up with an idea with a friend and you’re both still working hard on it two years later, then you know it’s something real. MW. I’m surprised the Corn Fritters are my favorite. I expected it to be the Avo Toast since everyone raves about it. Henry: We had a little celebrity chef in from Australia come in yesterday. His name’s Dan Churchill, he is an Aussie, and he’s kind of like the good kind of bloke-y kind of guy. He’s just come up with a cookbook called Dude Food and he’s here, then he’s going back, then he’s moving over for good to set up his own spot. The most lovely guy you’ve ever met. Like, incredible. Anyway, he gave us some tips on the fritters and so we changed the recipe yesterday, so it’s kind of like the new and improved. Now, there’s a little be of lemon zest in there just to pull the flavor out. He just kind of offered to come in at seven and he gave us advice on how to organize the kitchen better. MW. What can we expect for the future of the Two Hands menu? Are there seasonal dishes coming? Henry: There’s a few things. It’s all dependent on the space we have to work with. Not to sound boring or anything. Giles and I did it ourselves. We have the ability and some kind of practice with food, but we aren’t trained chefs so we didn’t try to do anything outside of our realm and our capabilities. But, yeah we have a new menu coming out hopefully next week. And, also, we have some new beverages that are going to be on there. At the moment we don’t have kind of bottled beverages—and we’re never going to have coke or anything like that—but we’ll have an Australian soda company, we’ll have some Kampuchea and some coconut water and then we’ll mix up our juice menu a little bit. Then, obviously, when we expand into a dinner service, that will be an interesting time, as well. And, we might be working with some talented Australian chefs on kind of sprucing that up for us. We have another girl who’s going to come on board and take the reins and take us to a new level. MW. Can I get a name? Or is that still secret? Henry: I don’t know, is it? Henry: She’s worked here for the last two years. Henry: At a few really nice restaurants and a few nice ones in Melbourne, too. She was in here every day when we first opened so we got to know her very well. She really understands what we’re going for and so when we were thinking of hiring someone who was able to take our menu from where it is now where we have, where what we love and like and what people really enjoy, to something that has expanded in options just a tiny little bit but also just refined in the things that we’re already doing. There’ll be some really cool things a lot of the stuff that we don’t even really know what’s going to happen when she comes on board. The discussions on food are preliminary but we’ll know a bit more in the upcoming months. MW. Henry, a question for you. As your avid Instagram followers have seen, you are newly engaged. If your fiancé were here right now, what do you think she would say about your success with Two Hands? Henry: Well, funny story. She was the first employee here. She’s really good friends with Gile’s wife and so, when we opened, she offered to help out for free just on the till, while, you know, when we up and got started. We didn’t have any staffers—just Giles and I, and we kind of just did coffee and pastries and whateva. And, she worked here for two weeks for free, and I knew her beforehand, but that’s when I asked her out for our first date which were whirlwind. I was so tired. And, we’d go out after work. And, I’d be kind of smelly. And, I’d go home and have to wake up really early, kind of tired and really excited and happy. And, she’s been a support ever since and throughout it. She’s seen it grow from day one and being behind the scenes and all of that little stuff that was happening—I mean, I’m really glad she was there for all of that. It was kind of special that she was there for all of that. I think she’s really proud of the both of us. MW. What does she do now? MW. Not to get too bromantic here, but what would you say to each other about what you've done here with Two Hands? Giles: I think I’d just say ‘thank you’. I’m very thankful to have Henry as a business partner and as a friend. And, I’m thankful for this cafe. None of this we "deserved". We worked hard. But this cafe wasn’t made by us. It was made by the people who come into it and the community around us and so many other factors that are out of our control. That’s the cool thing about whateva generation we’re in right now. You can hopefully do whateva you want and it’s not like you have to work fifty years and then you retire. You can be an astronaut and a cafe owner in the same lifetime. Henry: Drop the mic and get out of here. We’ll talk to Richard Branson about opening the first Two Hands in outer space. Many thanks to the incredible sponsors featured in this article! Cheers to you, Rebecca Minkoff, BaubleBar and Audrey and Daniella of Cutler Salon.